Michael Rocks will be running a series of four coaching sessions on Wednesday evenings during November for experienced players who wish to improve their skills. The sessions are limited to 12 players. If there is sufficient interest a second series will be run in the New Year. Note: These sessions are not aimed at new players. Notes from the Workshop held at the Khandallah Pétanque Club. Apologies: Barrie Sinclair (Manawatu), Ngaire Sinclair (Manawatu), Christine Strichen (Wanganui East), Richard Turfrey (Wanganui East). The workshop started off with a round-up of what everyone had been doing since the May 2007 Coaching Course at Kapiti. While there had been initial enthusiasm with the Performance Enhancement groups, these had basically stopped for various reasons. There was some discussion on what the new PNZ Coaching and Representation structure might entail. Throw a juggling ball through a horizontal hoop suspended above the ground. what rules changes might be required to even the game. The teams then redid the exercise to see if they could improve their score. Note: After lunch there was a demonstration of what the empty milk containers were for. In the afternoon, the discussion was on what we would like to see happen in the Wellington region. A suggestion was made by Dirk that the Coaches run a series of Regional Training days. After some discussion it was agreed to trial this concept on Saturday 11 October at Park Avenue from 1:00 to 4:00 pm. Attendees are to pre-book and provide an indication of their skill level (A - Experienced, B - Average, C - Beginner). The Coaches would divide up and look after one of these groups. There was some more discussion on the new Coaching structure. Graeme Morris will be reporting back to the next WPA Meeting (11 September) following the PNZ sponsored Regional Coaches get-together on 30 August. Situation - Score 11-11, 8m end, three boules on the terrain. Team A is holding 2 shots and has 1 boule in hand. Team B has 2 boules in hand and has to play. What type of tactics were the most appropriate? Situation - Player measuring to see who holds the point moves the cochonnet. What happens now? A Coaches' workshop, along the lines of the Umpires' workshop, is being arranged for all qualified (and prospective) Pétanque Coaches in the WPA Region. Possible dates are: Saturday 16, Sunday 17 or Saturday 30 August. To register your interest in the workshop, please contact Michael Rocks (mrocks (at) paradise.net.nz, or 04-973-0011). Note: The workshop will be for Coaches, not for players wanting to receive coaching. Kath Alison (Kapiti), Claire Bradburn (Silverstream), Sharon Cannon (Bay View), Fay Doyle (Kapiti), Gwen Hill (Kapiti), Jan McHardy (Kapiti), Michael Rocks (Khandallah), Pat Scholes (Kapiti), Barrie Sinclair (Manawatu), Bryan Wells (Horowhenua) successfully passed their Level 2 Coaching exam. The presentation of certificates took place at the Regional Doubles Championship at Horowhenua. 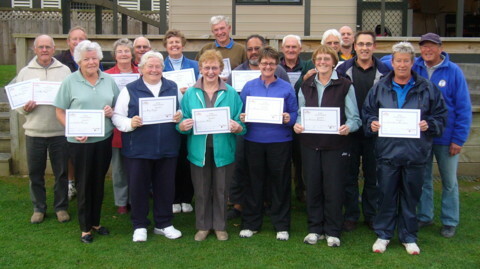 The successful participants in the first PNZ Coaching Level 1/2 Training course held at Kapiti Pétanque Club, 19/20 May. All participants were awarded their Level 1 Coaching Certificate, with Rex Hayes also awarded his Level 2 certificate under the "grandfather" clause. The remaining participants have the option of sitting an exam to qualify for their Level 2 certificates.